When separating the shutter crate from the body shell, gently push back the rangefinder sensor in to avoid damaging it when it catches on the body aperture when the crate is pulled out. 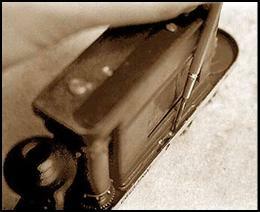 Remove shutter speed control. Unscrew „2“ to remove selector pin „1“. Under pin „1“ is speed control disc „3“. Cam „4“ controls B setting, and is pulled out after loosening spring „5“ which bears on it. 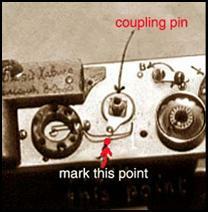 NOTE THE POSITION of the Coupling Pin relative to this cam: its point rests in the middle of the cam’s notch (see left and right pictures) when the shutter is wound. 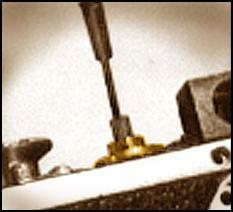 Spring „5“ is loosened by turning the screw, which holds it to the accessory shoe base, two or three times. Handle this spring CAREFULLY. 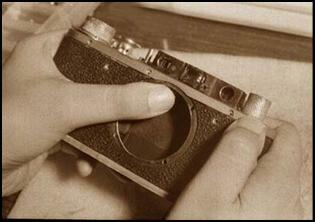 If spring gets deformed, shutter will malfunction. 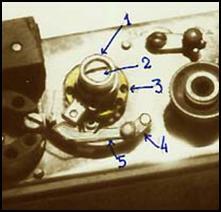 The speed selector disk is fixed by by a set screw to the shaft connected to the shutter drum. 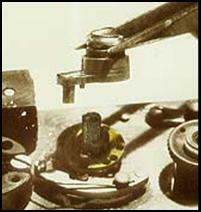 The screw is removed and the disk is lifted out. 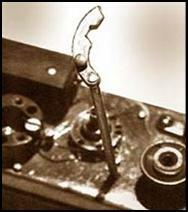 Some Zorki have two set screws on either end, as well as a stop bolt in front of one of the set screws. Note the position of the disk relative to the shaft. The disk must be reinstalled correctly or else, the shutter speeds will go wild. 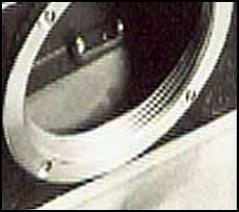 When the speed selector disk is removed, the coupling pin will be exposed. 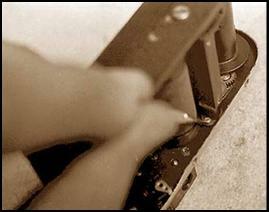 Note and mark the position of its lever (right picture) on the top plate BEFORE continuing disassembly. 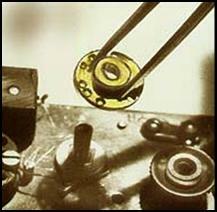 This determines the original position of the drum and the curtains. 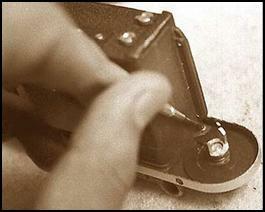 A badly reinstalled coupling pin will affect the shutter’s performance: no “B” setting, and likely, partial shutter capping. 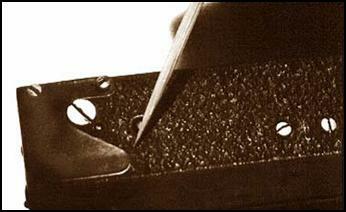 The shutter crate is held to the top plate by three screws: one is found next to the rewind fork, the other close to the top portion of the film gate, and the third, next to the shutter drum. The screws are of the same size. The one next to the shutter drum is the most difficult to handle. 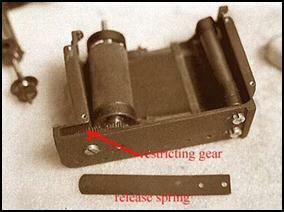 Remove the release spring by unscrewing the two bolts which hold it to the body. The same bolts hold the lower light baffle in place (middle photo), and reassembly of all these parts is difficult. Later variants have a shorter release spring held by its own bolts (right photo). The light baffle is still held by two bolts in the original position.